I participated in a Valentine stick pin swap hosted by One Happy Crafty Chick. Each participant was to make 5 stick pins and a card. My card turned out so pretty, if I do say so myself! I used some of my stash to make this card. I made a easel card to hold the stick pins for a beautiful presentation. Lots of embellishments were added in the corner and I also tucked in a stick pin. I've become obsessed with stick pins lately and they are so easy to do and not too expensive. Once the card is completely opened, there are more embellishments inside. Probably the hardest part in making stick pins, was finding the pins. but I was able to find them at Joanns and Hobby Lobby. Wal Mart carries a huge selection of beads so that helped keep the cost down. It was so much fun adding different beads and seeing how it came together. Now let me show you what my Valentine Swap partner sent me. Kim doesn't have a blog or YT channel but is a lover of scrapbooking YT videos like I am. Love this angel cat card and the stick pins are adorable. Love the angel stick pin!! was kind enough to include several cute stamps! And she also included some different trims and made me a pin cushion. I've been thinking I needed a pin cushion, just hadn't gotten around to making one. so this was an excellant gift! layouts from Macie's first birthday and 2012 Christmas. Before I end, let me share what I recently won from It's Only A Dream. Dawn made this vintage inspired Valentine bag with so many extras - tags, card, candy and all the pretty embellishments! And she even tucked in a stick pin and isn't that cupid so cute? Loving the vintage looking tags, all free printables on her blog. Also include in the valentine bag is a mini bag of M & M's. Such a cute idea and I'm so happy with all of this! Wishing you all a wonderful Valentine's Day! Awhile ago I joined a Facebook group named The Scrap Yard. It's a wonderful group of papercrafters that buy, sell or trade unwanted stamping, crafting or scrapbooking supplies. I have bought many things from this group and decided to try to sell some of my things on this page. if anyone on The Scrap Yard FB page would be interested in buying them. The response was an overwhelming YES! 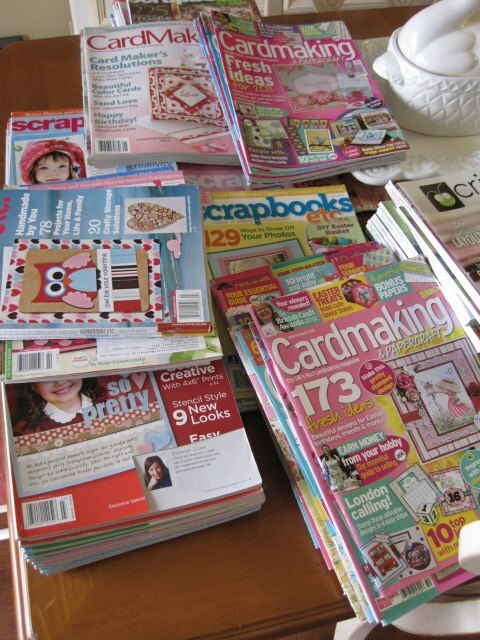 This is maybe half of the scrapbooking magazines that I put up for sale. Many of the magazines were bought off ebay several years ago. And then there's the magazines that I had subscribed too. I counted how many I had put up for sale. I sold 103 of them! and really happy because I made a little over $200! you'd be surprised how freeing it is! I orginally was going to share my latest found love, Downton Abbey. Have you been watching this series on PBS? The series takes place in the early 1900's, right after the Titanic sank. The wealthy Crawley family live in the massive castle with three beautiful daughters each full of passion while with the servants equally add to the storyline. I only recently started watching the series while Season 3 is now airing on TV. I clicked over to Netflix and began watching Season 1, which was the only season available. Good grief, I was not happy at all!! 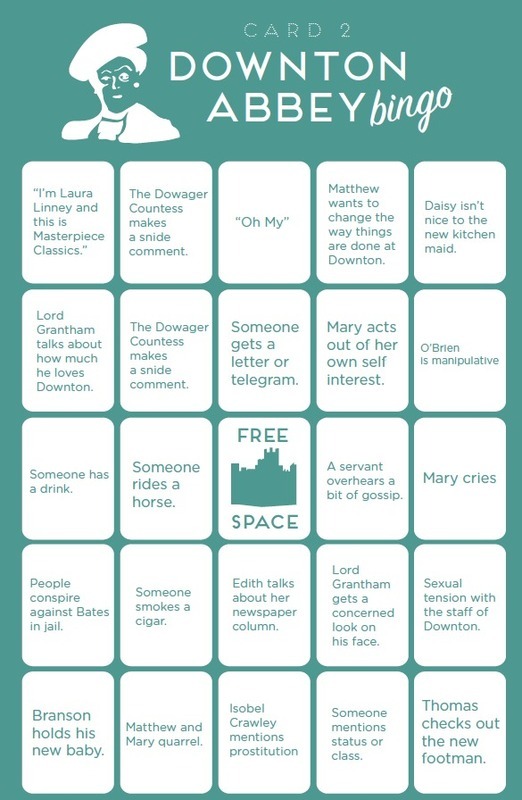 Thankfully someone commented on Facebook about a site, Simply June, that has each show available for free!! I, of course, clicked over and began watching the series. Now to the part of how this post changed, it's actually a money saving tip. what is available for viewing. 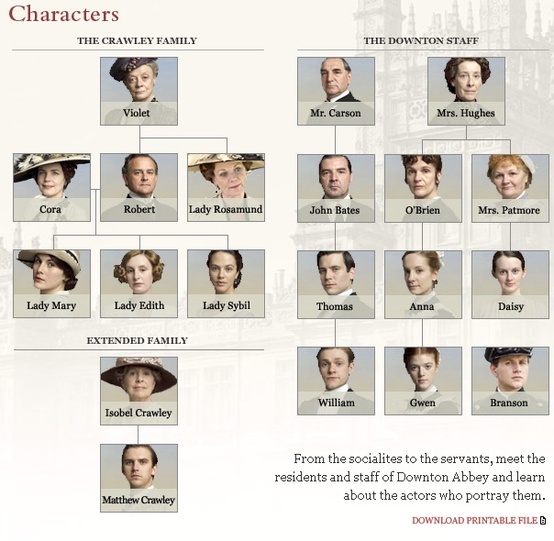 I also discovered that Netflix will lose the ability to show Downton Abbey in June, at that time, all Downton Abbey shows will be removed from their site not to mention, it takes forever for new releases to become available on Netflix. and the selection is AWESOME, it's CHEAPER and new releases are available right away! Currently the hubby and I are watching a series I never thought I would like, Breaking Bad. It's about a family and the dad is a chemistry teacher who is diagnosed with lung cancer. To help pay for the medical expenses, he begins to make and distribute meth. As I said, I am so surprised that I like this show. Are you a Netflix or Amazon viewer? Thank you to all who took the time to leave a comment. 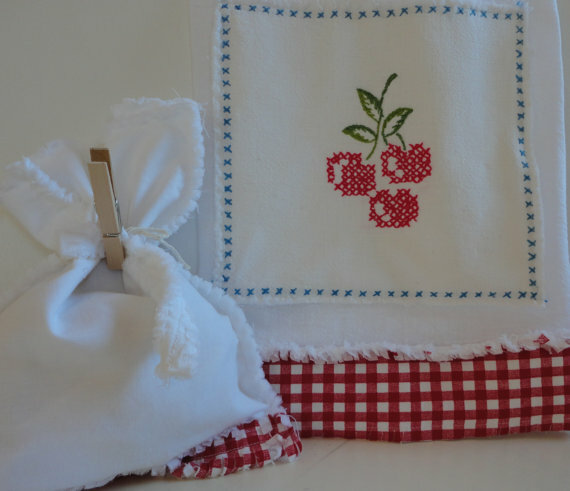 And also a huge thank you to Barbara for sponsoring this wonderful towel set! Tina from Ruffles and Relics. with your mailing address so we can get this sent out to you right away! Wishing you all a wonderful rest of the weekend!